If you’ve never seen the vertiginous, upside-down Danza de los Voladores, it’s worth a google. 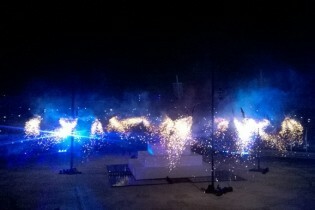 These performers added a unique dimension to the opening ceremony of the 22nd Central American and Caribbean Games as, for the first time, four teams simultaneously threw themselves off the top of four 30m high specially manufactured poles. The opening ceremony took place in the Mexican city of Veracruz, an area strongly associated with the voladores tradition. Manufacturing these poles was, for us, a very precise matter. Achieving stability and a tolerance of 25mm over the 30m pole height took careful calculation from our structural engineer, David Griffiths and construction director, Jim Almond. Securing the poles within the stadium environment required a system of stays and guys, with each pole being tethered to 15 tonnes of ballast in each corner of the stadium. 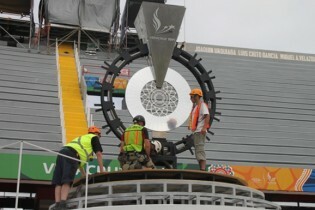 Working for Executive producer, Chris Laue, we also manufactured the cauldron for Veracruz 2014, using a variety of materials including stainless steel, aluminium and fire-rated FRP covered with a thermally sprayed metal coating. The geometric Aztec inspired design made good use of our 5-axis tooling facilities while our 3-axis facilities were put to use on the intricate fretwork on the mirrored central medallion.